Sometimes you just have to treat yo' self. With Christmas approaching, I found a little something extra and bought one of the greatest sets to ever come out of the LEGO lab, the Mercedes-Benz U400 Unimog. Should you get one before they're all gone? LEGO knows how to do it right, and the packaging on this set is fantastic. You get a giant flip-up box that shows the standard form, along with the many different versions you can create with the same pieces. There's the winch on the front and crane at the back, but if you choose you can instead create an articulated snowplow. Inside you find many different bags of semi-organized pieces. I say semi organized because while they're numbered up to 5, those numbers don't seem to be related to the instruction booklet and the pieces themselves aren't really sorted beyond overall size. I tend to hang on to nice packaging material (I probably have my first Apple laptop box buried somewhere) so this one will be sticking around. Like a good road trip, LEGO isn't about the destination but the journey. In the case of the 'Mog, that means 2000+ parts in 5 different instruction manuals. Originally I wanted to do a timelapse of the construction, but after about 900 photos I realized this is not a simple Sunday afternoon project and scrapped the idea. I spread the job over a couple days and probably spent 6-8 hours total. Having an age range on the box is basically pointless; I'm a 26 year old mechanical engineer! Following the instructions is more about attention to detail than anything else, but mostly what I learned is that I'm rather bad at placing stickers correctly. I tip my hat to the team of people responsible for creating this thing because it is seriously capable. It has 3 differentials, 4 possible gear selections for controlling the power take off and an arm with 4 degrees of freedom. Going through the different instruction booklets and examining all of the individual parts is a great way to learn more about standard mechanical components like u-joints, portal axles and gear ratios. The greatest part about it all is that once it's assembled, everything works! When I was about 13, I talked my way into getting a LEGO Mindstorms kit as a birthday gift by explaining how it would help to build engineering skills. During my last year of school, I used similar kits more than I had before! Find someone you know who might be considering a STEM education and build it with them. If they realize it's not for them, keep it for yourself! Now to the good stuff. After spending hours putting it together, it's time to show it off. Like the Unimog it's based on, this thing is all utility. Powered by a 9V battery pack, the motor drives shafts that can be switched between the front and rear power take offs and driving the pneumatic pump. Despite having 3 diffs, it doesn't look like the motor itself can drive the vehicle forward but spinning a gear manually you can still see all 4 wheels rotate together. Move the yellow lever up and the motor drives the PTO. The red lever controls whether that power is sent front or rear. With the current setup, that means either the winch or rotating the crane base. Shifting the yellow lever down instead redirects power to a pneumatic cylinder that provides air to the crane system. The red lever to the right of the controls is able to redirect that air front or rear, so you can even move the entire crane assembly to the front if you want to get crazy. The air coming to the back is split into these 3 valves that open and close the pneumatic cylinders. Slide the lever up and the arm extends. Bring it back and the arm retracts. It happens pretty fast so it takes quite a bit of finesse to get it smooth. There are 3 different pneumatic cylinders provided in the kit, with the 2 largest units powering the first and second stages of the arm. I didn't test for full capacity but it was able to pick up my Hot Wheels Aventador pretty easily. The gripper can be either open or closed and with the rubber clamps, holds things pretty securely. The front wheels can also be steered by a gear on the top of the cab but that's mostly an afterthought. There's a lot of slop thanks to the 90 degree gear connection at the bottom of the cab and since the kit is pretty heavy, there is quite a bit of resistance through the tires. You might say it "understeers at the limit". The U400 Unimog was only in production for a short time but thanks to its awesomeness, it's in high demand. I bought it on eBay, where prices ranged from about $300-600 USD. With shipping and duties to the Great White North, I came in at the lower end of that range. There seem to be a lot of new in box examples available so hopefully more will get into the hands of Jalops soon! 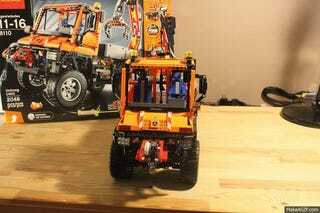 Christmas is coming, and there aren't many gifts for that Jalop in your life like the LEGO U400 Unimog. It's got motors, gears, a crane, a winch and compressed air! It's as much fun to put together as it is to pick up smaller, inferior toys. Get one before they're gone!